Jewelry. One of my favorite details to a ‘fit. Today I’ll be showing you my everyday jewelry pieces! These pieces are very much loved. It’s very rare that I’m not wearing at least one of these pieces on the daily. If I’m not, I’m either running super late or I’m having a bad day (I’m actually not kidding). As sparkly and fabulous as I would actually like to be on a daily basis, I’m not. So my everyday style really centers on comfort. Since it’s getting warmer now in Dallas, my everyday comfy has consisted of mom jeans, a tube top and/or a light sweater and slip on shoes which really compliments all the pieces that I’ll be showing you! Necklaces are my number one favorite jewelry pieces to style. First of all, they don’t get in the way when I’m really on the go, they just sit there, on your neck, all convenient. I love a good statement piece but dainty and simple are my favorites to style on the go. Here’s are my top 4 necklaces that I wear almost everyday! When it comes to pieces that reflect my spiritual beliefs, I do get them blessed regularly by a priest at church. The last three pieces you see here have been blessed several times for physical and spiritual protection. Rings are my second favorite. 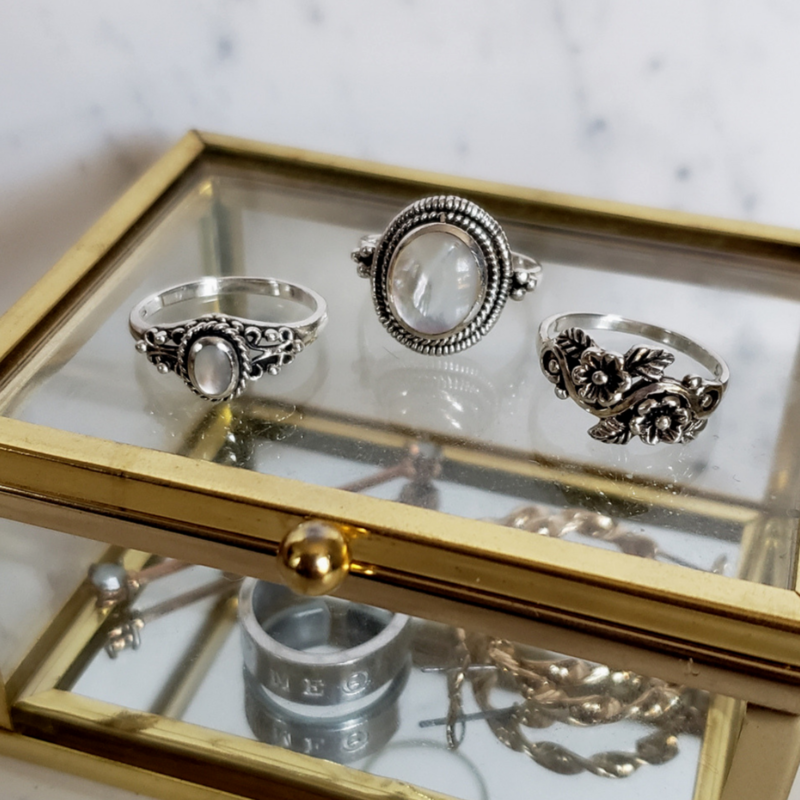 When I was younger, I always wanted to wear rings because I was young, I didn’t really have enough money (or really, any money at all) to drop on a custom ring and to be quite honest, I don’t think I was even aware that online shopping was a thing. Back then, I don’t think e-commerce was as big as it is now. Around the time that I started to really appreciate rings was when I really started appreciating doing my nails/getting my nails done. I thought a little accessorizing wouldn’t hurt and so I measured my ring to find out my ring size and low key went crazy afterward. Here are my top 4 ring styles in my collection that I never get tired of! Notice the custom ring I got made with my sorority letters in the gold box below! All the rings displayed here are all from Etsy! In general, most of my ring collection is sterling silver. I’ve always wanted to explore with gold pieces but those are also more expensive. Maybe one day, right? If you have any recommendations for gold rings that are good quality, come in smaller sizes, and are still affordable, hit me in the comments down below! For everyday, I usually go with stud style earrings. I have 2 sets of lobe piercings and an industrial. So it’s really fun styling different kinds of stud earrings to go with the type of industrial I’m wearing at the moment! Here are a few of my favorites besides pieces that will go with a basic sterling industrial bar. As of now, I haven’t really worn any other bracelet other than my My Saint My Hero Benedictine bracelets and my wooden saint bracelet (which you can get at your local catholic store or on etsy). My boyfriend actually got me this particular bracelet to match the one I got him for Christmas. It was so sweet of him. Okay, proud girlfriend moment over. Most days, I do choose to wear my Fitbit Ionic and so because of this, watches are last to purchase on any accessory list. Also, when I do purchase a watch, I choose very classic styles that will go with anything in my closet like the one down below! I love supporting artisans and buying my pieces from Etsy. I usually enter “dainty” in the search engine and go from there. I really like to personalize my pieces if I can and I appreciate the fact that I have this option when I shop through the stores. 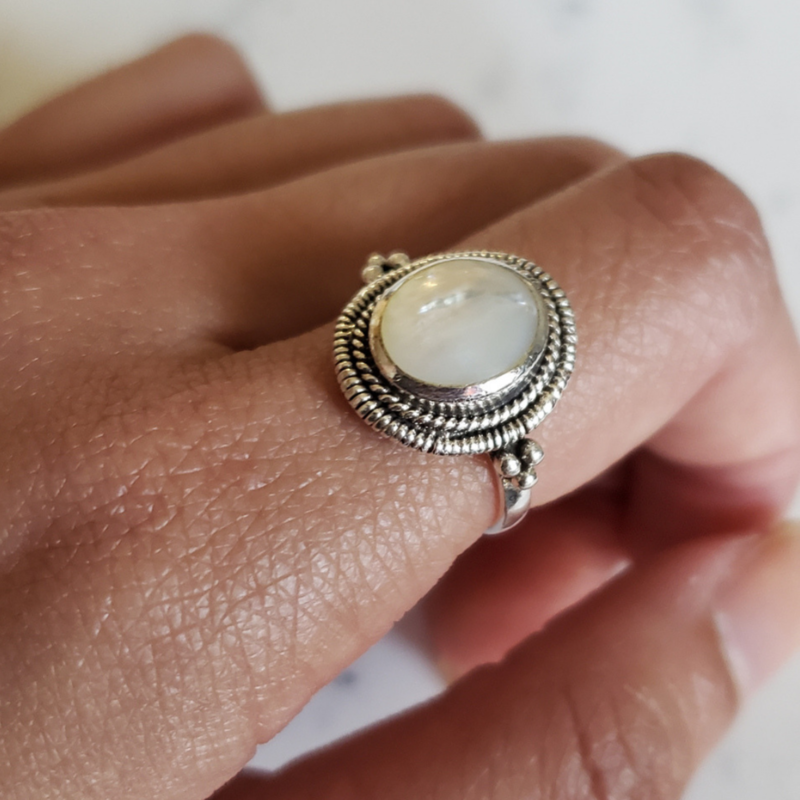 I have very petite fingers so I have to get ring sizes that would take longer for me to acquire at regular jewelry stores and I’ve found that Etsy really comes through for me! PSA: Etsy is a great marketplace to shop for loved ones! I purchase my Benedictine Medals here! They are so well done and are made by artisans who love art and who love God! I always have fun going to our local catholic stores. Like I need to not bring my all my money at one time when I go because I end up buying Rosaries for everyone. It’s a problem but not really (lol). 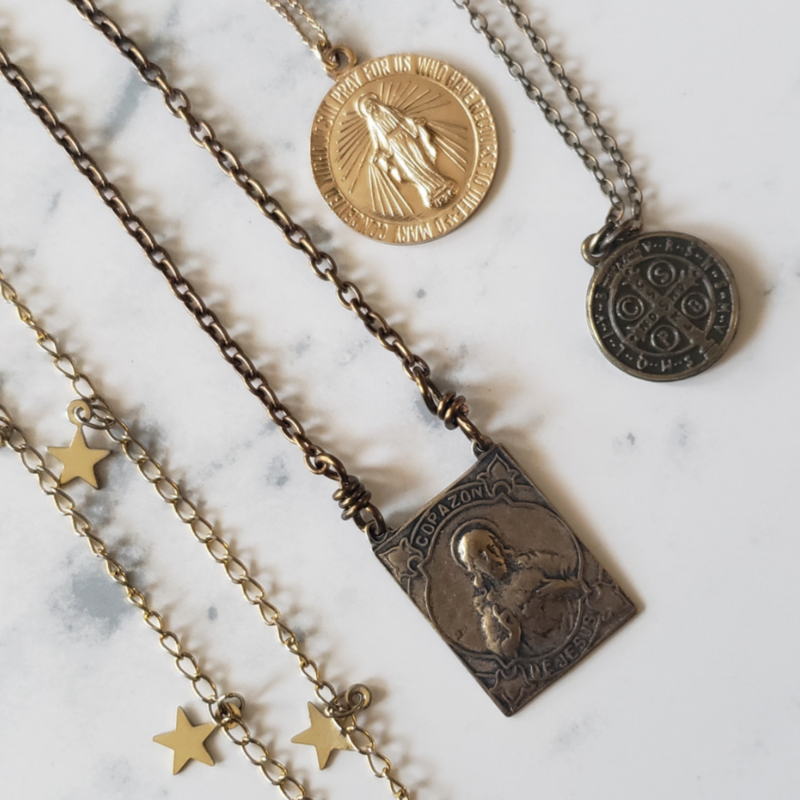 I feel like there’s always something new that I haven’t seen before whether it’s a new book/devotional or jewelry piece that I can gift to others as a reminder of faith. I love shopping through F21’s mobile application because there are actually some great sales on there that aren’t valid through stores! Dang. Forever 21 sponsor me, please - okay, thank youuu. I used to shop here when I was a young girl. I went in for a my second set of ear piercings and found myself exploring the store once more after soo many years! Basic sterling studs? Claire’s is so great for them! Just get your basic studs here and you’re all set! They’re great quality for the price too! I go to ASOS for a lot of my earing needs. I find that ASOS has a lot of classic styles that still cater the part of me that likes to explore trends. I can never go wrong with stud pieces at these locations. They always have interesting styles that match with anything for a reasonable price point and I always go back every season for new essentials or gifts for others! I hope you all enjoyed exploring my everyday jewelry pieces as much as I enjoyed sharing them with you! I think these pieces are great to gift yourself or to gift others (not to mention most of the pieces from here are from super talented artisans on Etsy so you’ll be gifting them as well with your support)! What are some of your go-to everyday jewelry? What was your favorite piece(s) in my everyday collection? Comment & link them down below to share them with our family on the blog! Sign up to get newsletters + updates on new content from the blog!